It has been a while since I last wrote about the Dallas Cowboys, for good reason — 4-8 doesn’t quite cut it. This post is not necessarily about them but inspired by them. Dallas has been playing much better football as of late and has been able to get a couple of wins. Each Tuesday, Bob Sturm writes an article for the sport’s section of the Dallas Morning News called “Decoding Garrett” where he breaks down important plays throughout the last football game (here is the link for this weeks post). Watching these plays is obviously much more enjoyable after a win. In this case, I cannot help but get the chills because you know your team made the crucial plays when they needed to. And the other side is often the complete opposite, you do not want to relive the game because you see the little things that went wrong that inevitably sealed your team’s losing fate. This all leads me to this. I realize the Cowboys are out of the playoff hunt and the rest of their games are essentially meaningless in the long run, but this could not be further from the truth for diehard football fans. Before each and every Dallas game I am a nervous wreck. It’s tough to say this for my other teams in different sports because they play so many more games throughout the season that it’s hard to say each game carries the same weight although they all technically do. With football, it seems like every game is the season, and everything is much more magnified. I really think this is why football’s popularity has surpassed every other sport in America. The fact that each team only plays once a week allows a lot of critiquing to be done for each game and a long time for losing teams, and fans, to redeem themselves. These outcomes often play a huge role in how our attitudes are going to be the following Monday. After a win you walk into work with a little hop in your step because you know you get to brag a bit, but when they lose you walk a little slower with your head slightly down. Of course, this shouldn’t be the case, but it’s tough not to let the outcome of the game carry over and determine your emotional state for the next few days. This emotional toll is exactly why the record of your team becomes irrelevant because there is still a period of time you get to experience the emotional high of a win (assuming your team wins at least one game). Their record aside, I am still rooting just as hard for a Dallas win every Sunday as I would be if they were Super Bowl contenders because I know how much better it feels the following Monday. 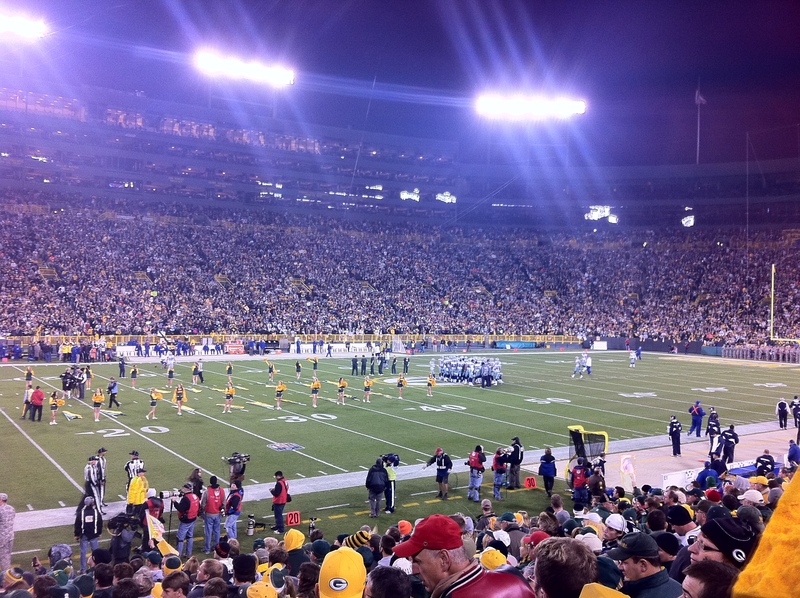 …Lambeau Field and the Dallas/GB game was amazing. The whole trip went about as smooth as possible as well. We drove to Appleton, WI which is about 30 miles south of Green Bay since we were not able to find a hotel room in Green Bay at such late notice. The last thing we wanted to worry about was driving to and from the game. We managed to find a sports bar down the street from the hotel which offered a shuttle to and from the game – how perfect. The bus left three hours before the game and took us to the same sports bar in Green Bay. This all sounds peachy, but about the only thing that was brutal during the entire trip was the 45 minute bus ride that ensued with just about everyone needing to go to the bathroom ten minutes into the ride. I did fail to mention that the buses were the big yellow ones…no coach buses for us. I don’t think anyone pissed their pants (at least no one in my group did). Once we were near the stadium and out of the bus, it was essentially 70,000 people eating, drinking, and yelling at the top of their lungs. I don’t think I could have asked for anything better. The atmosphere was insane. I went in rooting for the Cowboys, obviously, but knew deep down it wasn’t likely they’d win. Regardless, I was THAT guy in the stands yelling when the ‘Boys scored to make it 28-7 thinking we were back into the ballgame. The final score didn’t quite rile me up as much as usual (their 1-6 record coming in probably had something to do with it). I was there to experience Lambeau, win or loss. And that is exactly what I did. I also failed to mention the score was 45-7, if you didn’t know. Good thing the beer was cold. The Dallas Cowboys are doing some amazing things this year. No, that is not a joke. They are dominating on the offensive side of the ball and on the defensive side of the ball – both sides are in the “top” five, whatever that truly means is beyond me. Of course, this does not mean anything considering that they currently sit in last place with a 1-4 record, but it is truly amazing to watch moments of brilliance and dominance followed by utter stupidity. It seems as if the Cowboys’ players skipped Pop Warner and high school football and went directly to college and the NFL. Things like protecting the football, not committing penalties, and playing smart are all some of the first lessons you learn when you begin playing football. Although, I do not have much playing experience except for the years I spent in elementary and middle school playing flag football (Madden as well, if you want to count that), but these are lessons even I was taught. This is why it is amazing. These professional athletes are getting paid to play football at the highest level. They can catch, throw, and run with the best of ’em, but they cannot commit less than 10 penalties a game…seriously?! Maybe I have it all wrong. Who knows. It is easy to say what you want from the sidelines and as a fan, but I don’t see many other teams struggling with these same issues. This all leads me to exactly why I think firing Wade Phillips is just a way to cover up everything else. It is the easy thing to do; it’d buy the Cowboys a few extra weeks to dig up different excuses. With every loss, firing Wade will be brought up even though Jerry Jones has said numerous times he will not be fired during the season. Like I said in a previous post, sometimes you just have to look at the players. Example one and the only one I am going to use: Dallas gets an unsportsmanlike conduct penalty against Tennessee for excessive celebration after a TD. This costs them 15 yards and plays a pivotal role in them losing the game. This week, after their first TD against the Vikings they get an unsportsmanlike conduct penalty for excessive celebration. Ummm, I don’t care who the coach was, is, whatever – that is just dumb football. That didn’t quite go as planned, but then again, what has this year for the Cowboys? It has been an up and down ride thus far through four games. My analysis is no different than it has been for any of the other losses – too many penalties, too many turnovers, blah, blah, blah…we’ve heard it all before. The one thing many articles I’ve read this week are focusing on the run/pass ratio of Dallas. The one game they made a point to run was their lone win of the season at Houston. If you really look at it though, many of the runs came in the 4th quarter when Dallas had the lead so this is a bit misleading. Dallas believes it’s a passing team with all of the receiving threats that they have, but they cannot simply drop back and throw every time and win like the Colts, Saints, and Pats. They try to sprinkle in the run and keep the defense honest. I do believe they need to run the ball more, but is it really that simple? We’ve heard all season long how bad their offensive line is so what makes everyone think they can run the ball? Is running the ball just to run the ball going to be effective? I do think the offensive line is a little better than everyone thinks. The one thing that might happen if the Cowboys run more: less penalties. The offensive line struggles in pass protection which was clearly evident against Tennessee. This results in them holding and false starting more because they cannot consistently block their man straight up for the extended period of time that is needed. If they run the ball they only need to block their man for a short period of time. Hey now, I am just trying to look on the bright side. They’re 1-3 so I think it’s more than just the run/pass ratio. The Dallas bye week is behind us. The MLB playoffs are underway. It is a great time to be a sports fan right now. The Ryder Cup was as thrilling as I’ve ever seen, albeit I have not seen many Ryder Cup’s in my short existence here. Either way, seeing Hunter Mahan duff a chip when the cup was on the line makes me feel a little better about my golf game; I am not quite sure why, but it does. Then again I am not sure I’d my golf game a golf game after the way I played last weekend. I think I ended up losing more golf balls than the number of holes I played. Speaking of the MLB playoffs, there have been a number of great performances already. Roy Halladay threw the second postseason no-hitter ever, and it was his first postseason start – can we say clutch? Tim Lincecum also dominated last night striking out a SF Giants’ playoff record 14 batters. The Minnesota Twins have also put on quite a display. They have continued their utter abysmal play against the Yankees. It really is impressive that the Twins have scored first in the last 9 games against them and lost every one. And apparently the fans knew what they were doing in Tampa by not going to the games seeing as the Rays have been outscored 11-1 in the first two games. Who would have thought the Rangers would be in the ALCS this year? It is impressive, and they have as good of a chance has anyone to beat the Yankees. I am thrilled Dallas will be back on the field this Sunday, and I will have more to root for than my fantasy guys. I will be watching to see if Dallas can get their first W at home this season against the Titans. I would prefer the duo of Tony Romo and Miles Austin to dominate the game and box score. That way the ‘Boys as well as my two fantasy teams will all finish the week as winners.